The online Gender Sourcebook, developed by USAID Adapt Asia-Pacific and launched in 2014, enables project proponents to design gender-responsive climate change adaptation measures as well as projects, particularly in developing countries, by providing targeted, sector-specific guidance and real-life examples that are easy to follow and navigate on laptops and mobile devices. USAID Adapt Asia-Pacific also produced Gender and Climate Change Adaptation: A flexible training package with ICCCAD, which can be applied in various short courses and workshops. The Sourcebook is intended to be used mainly by individuals and teams who prepare large-scale climate change adaptation (CCA) project proposals. The sourcebook covers major development sectors affected by a changing climate, including agriculture, coastal management, biodiversity conservation, energy, and transportation. Overall, it provides readers with tools to help answer the question, "How do we best go about incorporating gender considerations into our CCA proposal?" We understand that Sourcebook readers will come from a wide array of backgrounds, including gender specialists, CCA specialists, engineers, economists and others. Users will find that each section of the Sourcebook is self-contained, alllowing you to go directly to those sections, tools, and sectors of particular relevance to your work. As a general guide, we have suggested below sections of the Sourcebook that may be particularly useful to readers. The first set of suggestions is for those readers who are gender and CCA specialists, while the second set will be helpful for non-specialists. The Sourcebook is a live document that will be periodically updated. A pdf version is available to download from the right-hand column. Section 6 provides a summary checklist for addressing gender (Table 1) within typical CCA proposal sections, as well as summarizing gender-related data needs and monitoring, and providing links to gender tools. This information is framed by the requirements and guidance available for six multilateral climate funds. Section 7 summarizes key gender analysis topics for climate-relevant sectors and recommends entry points and indicators. The sector modules covered are agriculture; forestry/watershed management; biodiversity conservation; coastal water resources and fisheries; water, sanitation and hygiene; health; energy; transport; and urban programs. There is also the opportunity for users to tell us how they have used the Sourcebook for proposal preparation or other activities, which sections were most helpful, and what improvements should be made during future revisions via the In Send Feedback feature. We would like to hear about the proposal adjustments that you make to address gender issues and strategies and the gender outcomes that are achieved during implementation. We would also welcome contributions of your gender-sensitive CCA proposals, ToRs for gender experts on different types of CCA projects, and reports about gender-related results during project implementation. 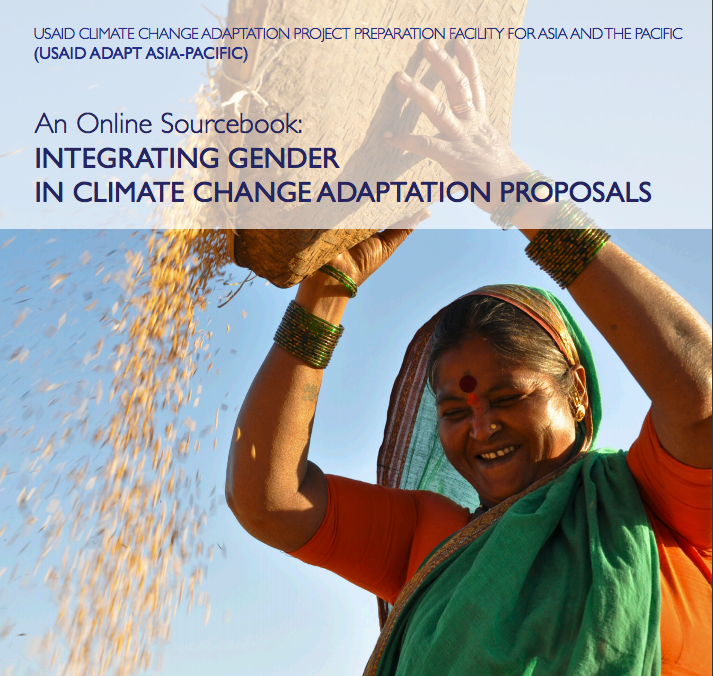 USAID Adapt Asia-Pacific (2014) An Online Sourcebook: Integrating Gender in Climate Change Adaptation Proposals. USAID Regional Development Mission for Asia: Bangkok, Thailand.